Unterschätzen Sie nicht die Macht*. 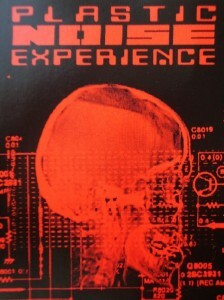 Teutonic onslaught on American soil was the result when Californian label Van Richter hosted a release by Plastic Noise Experience (PNE), at that time a two-man project of S.M. Kalwa and Claus Kruse. “Neural Transmission” moves between industrial and EBM, and is a compilation based on PNE’s three releases from the first half of the 1990’s. For the start a worldwide hit, rougher cover of Bronski Beat’s “Smalltown Boy”, but the rest is written by the band itself. “Serious Times” is an industrial song with smoother synths and lyrics but for the rest you get plenty of furious machines and raucous German vocals. Bursting power in “Kill The 6″, Tateinheit” or “Das Ritual”, etc. Some tracks at the end (“Illusions”, “Treat The World”) dive more into (new) wave sounds with a certain portion of piano and Glockenspiel. Critics may say that “Neural Transmission” cements the worst stereotypes about German electronic Marschmusik. Still it’s an adrenalin-filled release from PNE that seems to be still around, after having in the noughties dealt with the industrial label Alfa Matrix.